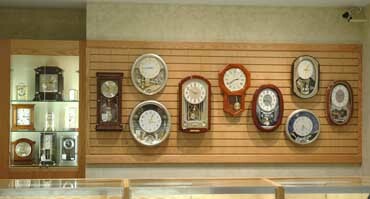 D & M Perlman Fine Jewelry & Gifts is proud to be an authorized dealer for a variety of clock lines. Clocks can be the perfect gift for many occasions. The Seiko Melody In Motion and Rhythm USA clocks play a tune on the hour with animation. Animation may include a moving dial, lights and other moving figures all in sync to the melody. We also carry a variety of desk clocks. What shows above is just a small sampling. We invite you to stop in to see our entire collection soon.